Proximity Sensor Overview - A description of the proximity sensor, how it works, and problems it has. Modification #1 - PC-board mounted pot for sensor. Modification #2 - Added resistor for sensor. Modification #3 - Installing jumper wires to eliminate cable connector problems between boards. The Twilight Zone ball trough proximity sensor consists of two components- the main "driver" board, with LED mounted on it, and the actual "sensor", or electromagnet, that mounts at the front of the ball trough. When a large-enough metal object (a ball) is in front of the "sensor", then the electromagnetic field it generates is disturbed, and the "driver" board detects this disturbance, and lets the game know that there is a metal ball in front of the sensor. 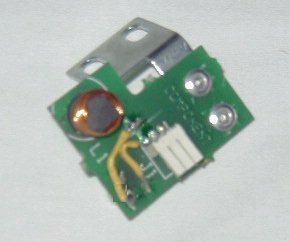 The proximity sensor board under the center under-playfield ramp is identical to this, but has it's coil, or sensor, mounted on the same board as the driver circuitry. The proximity sensors used in TZ were the first design of their type, and have one shortcoming which is the lack of being able to adjust the sensitivity of the sensor circuitry. Later games such as ST:TNG, Scared Stiff, and Theatre of Magic used similar proximity sensors that actually had adjustable trimmer pots mounted on their PC boards, so the technician could adjust the sensitivity of the unit. 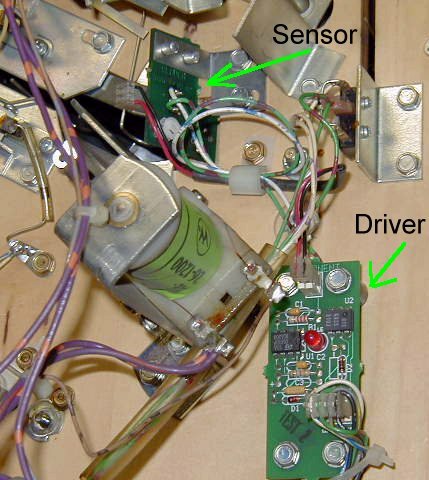 Adjust position of sensor board- two screws hold it to the playfield and it can be moved closer to, or farther away from, the ball in the trough. Check for cracked solder joints on the backs of the connector pins on both boards. Check for dirty or otherwise poor connections between the connector pins and cable connector housing on the small cable that runs between driver and sensor boards. We will describe two modifications that you can make to your existing TZ trough proximity sensor unit to make it adjustable, or more sensitive. Either mod should make the unit function better, or function- period. And we will also describe one mod to make help the two PC boards maintain better connections so that intermittent problems don't occur down the road. Note: Either Modification #1 or Modification #2 should be made- not both. Read through each mod first to determine which you would prefer to make. 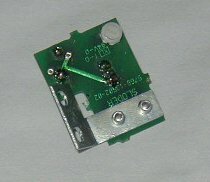 This modification adds a small PC-board mount pot, or trimmer, to the sensor PC board, which allows you to always be able to adjust the sensitivity of the sensor. Step 1: You'll first need to obtain a small PC-mount trimmer pot. We recommend the lowest resistance rating you can get (something around 100 ohms would be ideal, but the most common "low rated" pots are about 1k (1000) ohms). Some of these small pots can be very, very touchy, so it's best to get one that has a low resistance rating, and allows you a good accurate adjustment. The average amount of resistance you'll want from the pot is around 20 to 30 ohms, so check your pot with your meter first to make sure it will let you adjust it easily to this value. See image below to see the pot that we used. Step 2: Remove the sensor from the game. Two hex-head screws hold it to the underside of the playfield. Make sure power is turned off while doing all modifications! Step 3: On the component side of the board, cut the trace between the connector pin and the sensor. This is the only trace on this side of the board, so you can't miss it. Use a sharp knife, or X-Acto blade, to slice through the trace. Use multimeter to make sure there is no continuity after you've made the cut- if there is, cut some more. 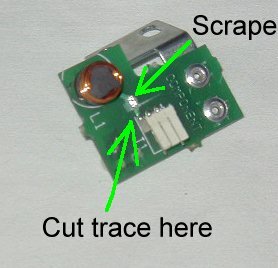 Step 4: Scrape some of the insulation off the trace that leads to the sensor (see image above). Remove enough to adequately solder a jumper wire onto the bare metal of the trace. 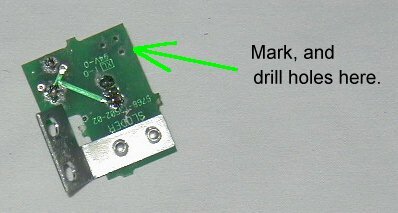 Step 5: On the solder side of the board, use a small marker to mark the position of the 3 legs of the trimmer pot onto the PC board, and drill three holes in the board through which you will mount the pot. Use a very small drill bit. Step 6: Install legs of pot through the holes you drilled in the PC board, then bend the legs on the other side of the board to hold the pot on the board. Step 7: Back on the component side of the board, connect two small jumper wires to the pot. One jumper wire will come from the back side of the pin on the connector (the one with the trace going away from it), and the other jumper wire will come from the other side of the trace that you cut, where the insulation was scraped away. Connect the other ends of the jumper wires to the pot- one goes to the middle leg, and the other goes to either side leg (doesn't matter which side leg). Modification complete. At this point, you may want to make the third modification as described below, before re-installing the sensor board into the game. Re-install the sensor board and the cable that goes between it and the driver board. With the sensor board installed, the pot should be easily accessible with a small flat blade screwdriver (see image at top). Power up the game, install one ball in the ball trough (up against the sensor), and adjust the pot until the LED on the driver board just turns ON. This indicates that the sensor has detected the metal ball. Move the ball back into the trough and the LED should go OFF on the driver board. Adjust the pot accordingly. This modification adds a resistor to the sensor PC board, which makes the sensor more sensitive. Follow steps 2, 3, and 4, as described above. Step 5: On the solder side of the board, connect one end of the resistor to the end pin on the connector which does not have a trace coming from it. 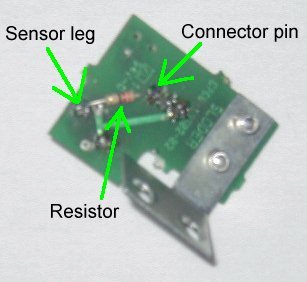 Connect the other end of the resistor to the leg of the sensor that is not connected to the trace on this side of the board. Re-install the sensor board and the cable that goes between it and the driver board. Power up the game, install one ball in the ball trough (up against the sensor), and the LED on the driver board should turn ON. This indicates that the sensor has detected the metal ball. Move the ball back into the trough and the LED should go OFF on the driver board. The cable that runs between the driver and sensor boards is a constant source of problems with this system. Mainly, poor connections can develop and the connector pins on each board, or in the IDC cable connectors themselves, and this can cause intermittent connections, and the game can get confused. To remedy this problem, we first recommend reflowing the solder on the connector pins on each board. Next, we recommend soldering two wires directly between the boards, to the backs of the connector pins on the boards. This makes a direct connection, and eliminates any possibility of intermittent connections from bad/dirty connectors. We also recommend reinstalling the cable, too, just so it stays as part of the game and doesn't get lost. When doing this, you must observe polarity with the new jumper wires you install to the boards. If the wires in the cable don't match up with the jumper wires you install (pin 1 to pin 1, etc), then you are basically shorting out the sensor and the sensor/driver won't operate properly. So observe polarity when soldering jumper wires directly to the boards. See the image at the top of this document to see the jumper wires we've added (white and green), and note that the original cable is still in place.